English broadcaster Arirang TV has a new music show ``The M-Wave'' that will hopefully satisfy those searching for a bit more K-Pop. The show will air every Sunday at 6 p.m., and be broadcast in more than 180 countries, introducing new groups and tracks from the local music scene, while featuring some of the most popular bands. Hosted by girl group f(x)'s Krystal and Cheondoong from MBLAQ, the show had its first shoot last week, and it was evident the two newcomers were apprehensive hosting such a big program. The two stood on a high platform clutching cue sheets in their hands and nervously memorizing their lines. ``This is the M-Wave!'' they shouted to the camera with big smiles. After a couple of attempts, the ``guy with rhythm'' and the ``girl with style'' finally finished their first take. ``I'm so glad to be hosting a show with Cheondoong, and we will both do our best to bring the best. It's been a while since I spoke in English for so long and I thought it would be awkward. But after a few takes, I think I got used to it,'' Krystal, 16, said during an interview after filming. While Krystal seemed to get more comfortable as time went by, it was Cheondoong who went through a difficult time with his lines. The 19-year-old released his tension with subtle dance moves and jokes, but took some time getting down his lines. ``I was so nervous! I'm not good at public speaking in general, and so I'm grateful to everyone who went through my awkwardness and mistakes. I'll make sure I get better,'' he said, laughing. 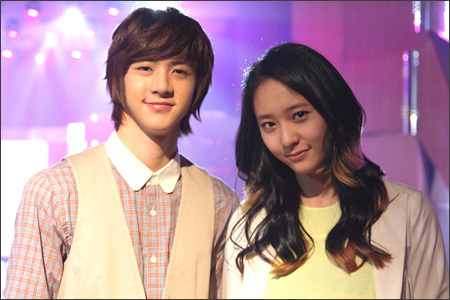 The two singers both have experience abroad: Krystal was born and raised in the United States, while Cheondoong was born in Korea, but grew up in the Philippines. Another similarity of the two is that they both have siblings working in the entertainment industry: Krystal is the sister of Girls' Generation member Jessica, while Cheondoong's sister is Sandara Park, member of girl group 2NE1. ``My sister sent me a text message yesterday night. I think she couldn't believe that her younger brother was hosting a music show. Her message read ``Wow, but you're such a baby,''' he said. Instead of simply broadcasting music videos and having top singers perform on stage, ``The M-Wave'' is looking for some interaction from its Asian viewers. Arirang TV has joined various music channels around Asia, including Channel [v], to offer a non-stop music show, while viewers around the world can log on to the program's Web site and chat with their favorite K-pop singers through Skype during the ``SKY TALK'' sequence. Another interesting part of the show is ``Hello K-POP,'' where a VJ or the host will present Korean songs that made it to music charts in different countries. For more information on the show, visit www.arirang.co.kr/TV2/Mwave/ or check out the program's Twitter at www.twitter.com/themwave2010.